Update: Please have a look at my 4-key-keyboard project as well! To maximize the functionality of the 1-key keyboard, I implemented having a different key being sent to the computer for a key-down and a key-up event. This can be useful when you create for example a prototype that has to detect whether a physical object is pushing down a switch or not. This project implements V-USB (previously called AVR-USB) from Objective Development to emulate a standard USB keyboard using an Atmel AVR microcontroller. This project has been heavily inspired by the EasyLogger Reference project. 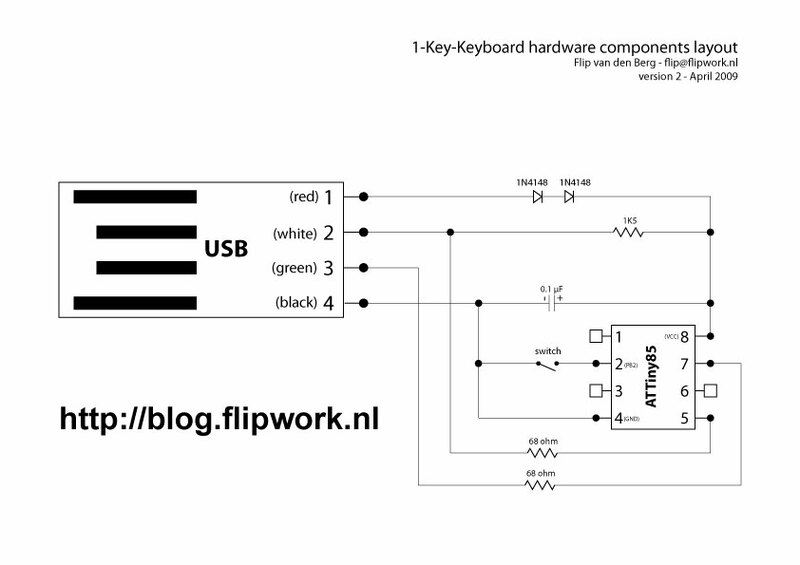 This 1-Key-Keyboard can be plugged into any computer and will be recognised as a standard USB keyboard. When closing the switch, the keystroke ‘]’ will be sent. When opening the switch, the keystoke ‘[’ will be sent. Here’s the actionscript 3.0 code for a demo-program which detects whether the switch is pressed or not. If the switch is pressed, the movie-clip ‘onSwitch’ is visible. When released, the movie-clip ‘offSwitch’ is visible. Try it out by clicking here and press/release the switch on your 1-Key-Keyboard. Please feel free to leave comments on my 1-key-keyboard project! If you have a ATTiny45 or ATTiny85 you can Download here a precompiled .hex file for my 1-key-keyboard project. 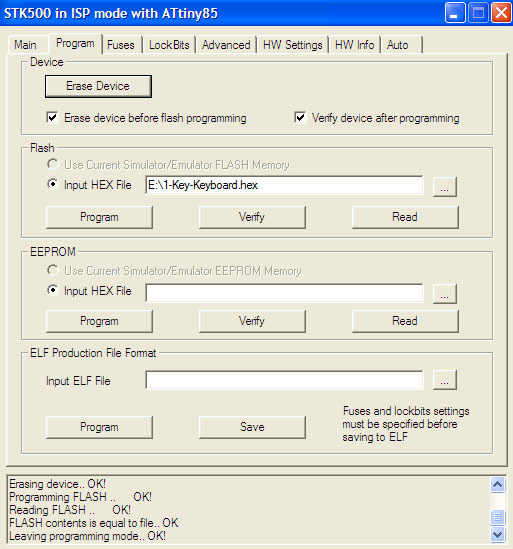 For other microcontrollers you’ll need a .hex file which is compiled for it. Connect with AVR Studio to your device by pressing the connect button and selecting your programmer from the list and connect. Before programming the actual firmware, the fuses need to be set on the AVR. Now you’re ready to program the actual .hex file on the AVR. Now you have successfully uploaded the code to the AVR! After starting up AVR studio, press the connect button. Then In the “Main” tab, select the ATTiny85 as Device. Reading signature .. 0×1E, 0×93, 0×0B .. OK! There are 2 ways of programming an ATTiny85 microcontroller using the Atmel AVR STK500 programmer. The first one is In-System Programming (ISP); The most common way of programming AVR’s. 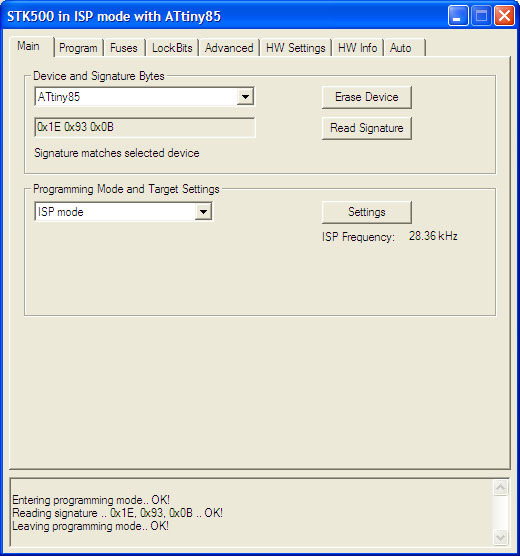 The other way of programming the ATTiny85 is High Voltage Serial Programming (HVSP). This is the only way of programming that can be used after the ‘reset disable’ fuse is set on the ATTiny85. • One wire to connect the PB3 pin (pin 4) on the PORTB header to the XT1 pin (pin 7) on the PORTE / AUX header. This is to connect the clock system to the AVR device. • The second wire to connect the PB5 pin (pin 6) on the PORTB header to the RST pin (pin 4) on the PORTE / AUX header. 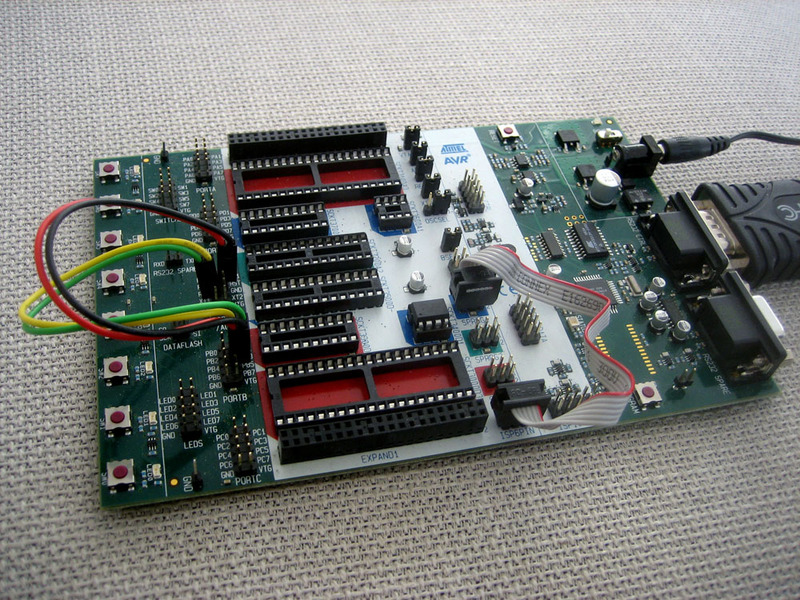 This is to connect the reset system to the AVR device. 2. 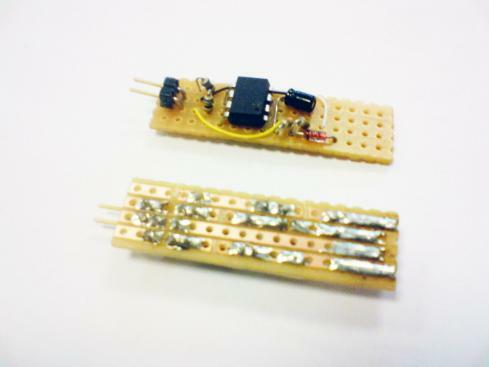 Place the ATTiny85 in the SCKT3400D1 socket and make sure all other sockets are empty! 3. Mount jumper OSCSEL on pins 1 and 2 to select software-controlled clock. 4. Mount jumper XTAL1 to route the oscillator signal to the device. 5. Mount jumpers VTARGET and RESET. 6. 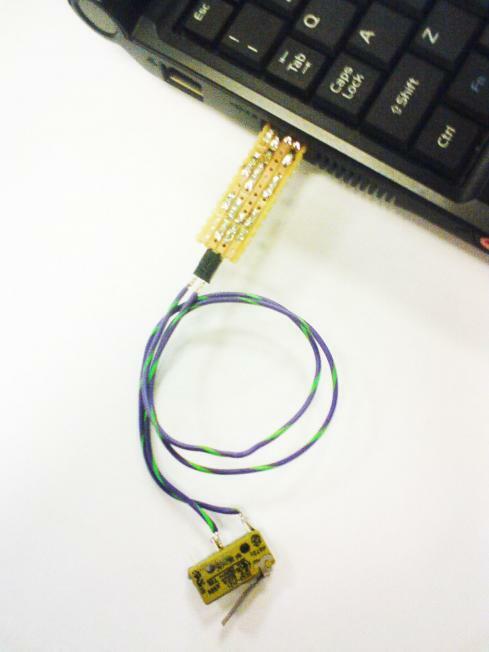 Use one 2-wire cable to connect the PB3 pin (pin 4) on the PORTB header to the XT1 pin (pin 7) on the PORTE/AUX header. This will connect the clock system to the AVR device. 7. Use another 2-wire cable to connect the PB5 pin (pin 6) on the PORTB header to the RST pin (pin 4) on the PORTE/AUX header. This will connect the reset system to the AVR device. 8. 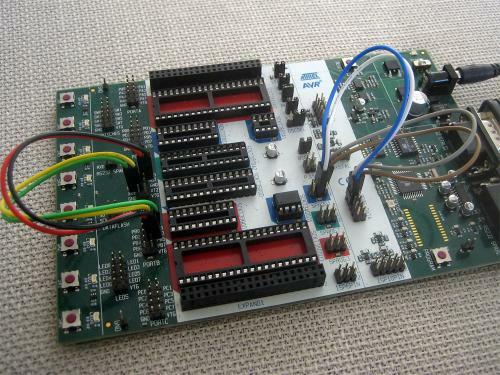 Use a third 2-wire cable to connect the PB0 and PB2 pins (pins 4 and 3) on the SPROG1 header to the DATA0 and DATA2 pins (pins 1 and 3) on the PROG DATA header. 9. Use the last 2-wire cable to connect the PB1 pin (pin 1) on the SPROG1 header to the DATA1 pin (pin 2) on the PROG DATA header. 10. Switch power on and you are ready to program.